Stealth. It's a fun word to say, but say it too many times in a row and (like many words), it really starts to feel a little funny in your mouth. Go on. Do it. See? 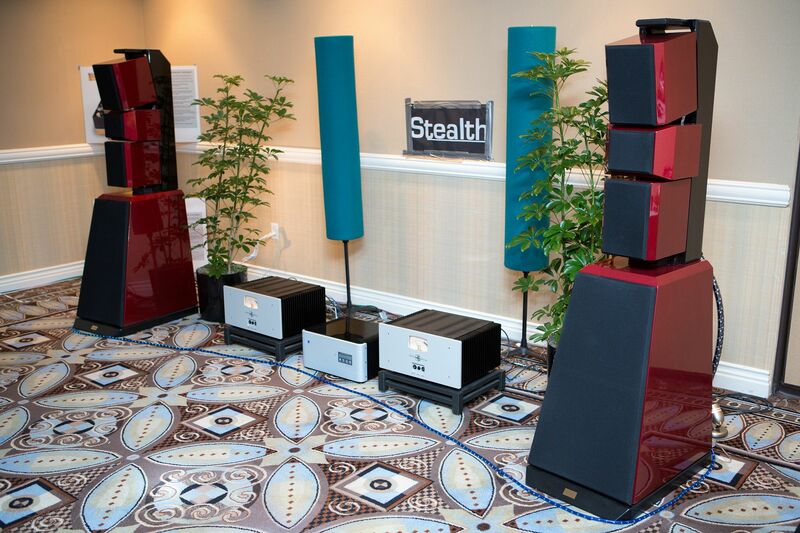 Anyway, Quintessence Acoustics was showing off the big Stealth ($75k/pair) here at the Flamingo, and this was quite a showing. This is the second time I've heard them, and I can say that both these experiences were ... well ... impressive. Have I mentioned that the Stealth is a big speaker. Like … ah … really big. It’s similar to a Wilson XLF in size, actually, and the separate enclosures for each driver may bring that “Wilson” resemblance even more strongly to mind. It did for me. Shown here with PBN electronics, this room was positively thrumming with power and authority — some of the best demo-show bass I’ve heard. Images were large and well-sketched. Dynamics were simply outstanding. Did I mention I was impressed? Scot, Thanks for coming by our room. The Stealth SVI (Series Six), has been in production for 20 years, however we primarily have been exporting to the far east for most of that time. We now will be actively marketing in the good old US of A …. Glad you liked what you heard. See you in NEWPORT. Thanks for stopping by this room. For whatever reason the major audio mags completely ignore these guys, but if somebody at Magico sneezes, there’s a stampede to be the first one there to cover it.